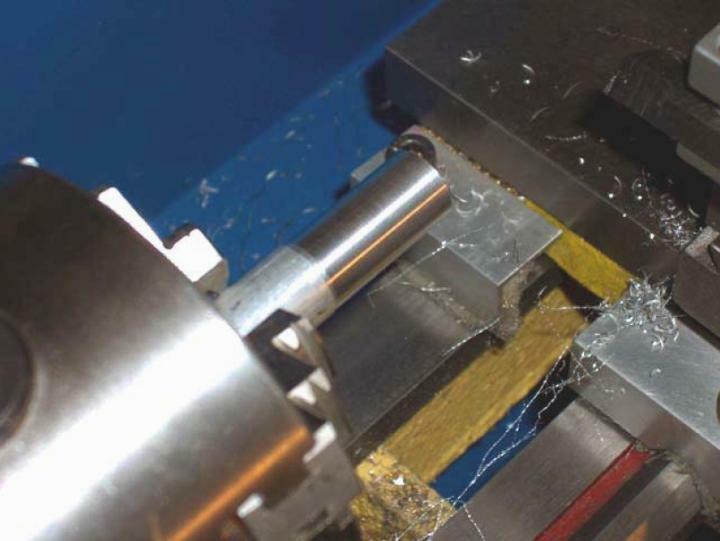 This excellent article was written by Bob Bickerton, a new contributor to Machinistblog.com. It was originally published to the files section of the Yahoo 7x12minilathe discussion group. 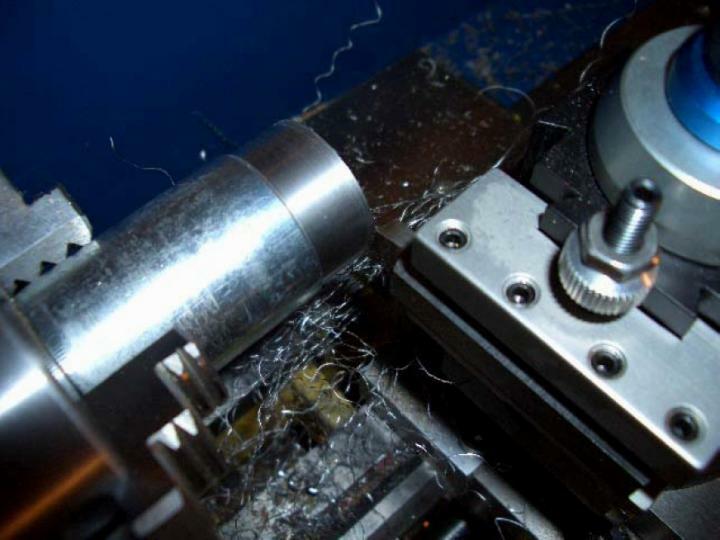 The slowest feed rate on the Mini-lathe is about .004 in/revolution. This is fine for many applications but when you want a nice, smooth turned finish the slowest rate isn’t slow enough. You can set the knife tool to ‘rub’ and that helps sometimes. And, there have been modifications published that allow the slow feed to be reduced, but all require building something for the lathe. 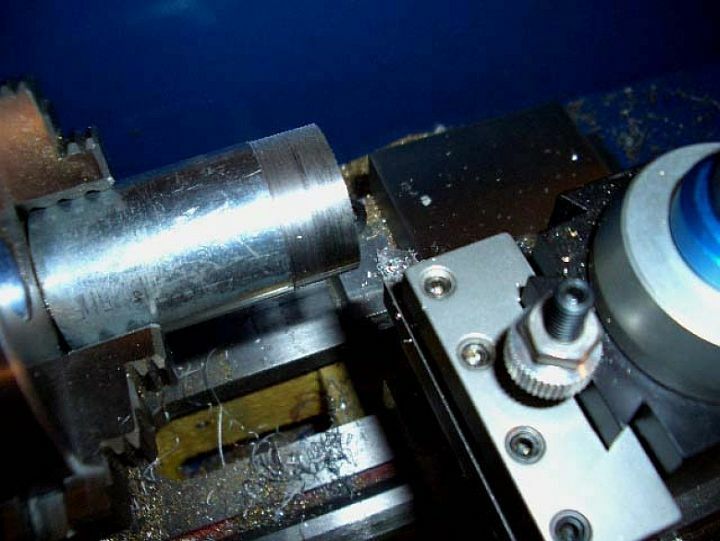 Here’s another option that only requires one to grind a HSS tool blank to a different shape. It’s a “Contrary Ground Finishing Tool” described by Frank Burns on page 58 of the Jul-Aug. 1997 issue of Home Shop Machinist magazine. Here’s how I do it. I turn the OD of the work piece with the usual ‘knife tool’ until it’s about 10 thousandths oversize. Then I mount my ‘finishing tool’ and adjust the cross feed to just skim the surface (about a thou or so). Note the cross slide in feed dial reading. Measure the OD and set the cross slide to remove about half of the still oversize work piece. Measure the OD again, and if everything went well you should have removed half the oversize. If so, set the cross slide to remove the remainder and, presto, you have a nicely turned finish on specification size. 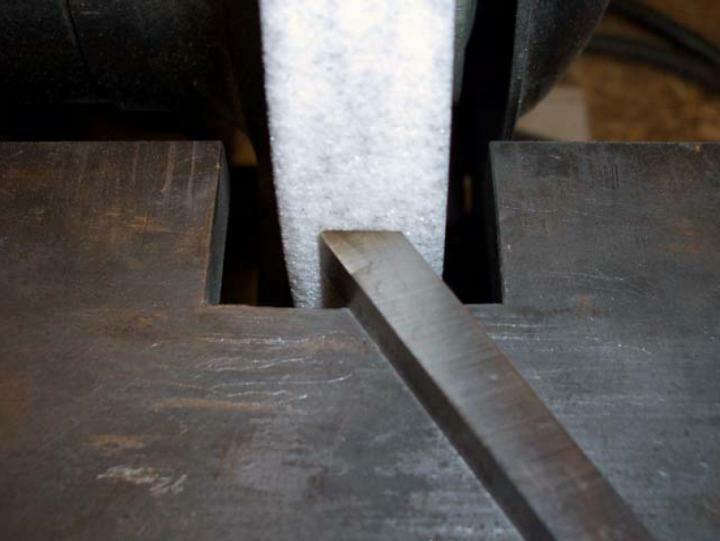 If the first pass removed a little more or a little less than half, make an appropriate adjustment before the final cut. Here’s a picture of some EMT conduit mounted in the chuck of my Cummins 7x12. EMT is welded steel tube and difficult to finish, at least for me. 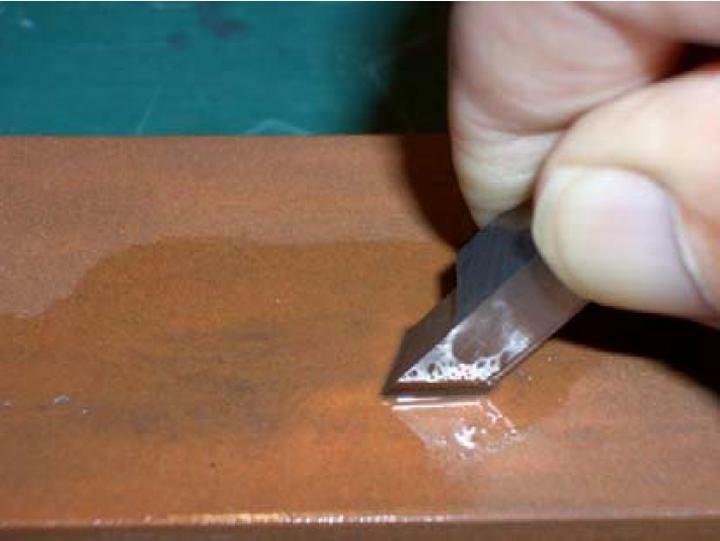 The welded seam can be harder than the surrounding area making it difficult to get a good, smooth finish. The front has been machined with my usual knife tool. The finish doesn’t look to bad but it is rough to the touch. Here’s that same piece after using the ‘Finishing Tool.’ Hard to tell from the picture but the finish is very smooth to the touch. Because the tool cuts on the front it doesn’t need to be exactly on center height. You can’t cut up to a shoulder because of the geometry. Because of the high level of interest in this subject, I decided to show how I grind the tool and then show it in use. Here’s how I do it. Here I show grinding the back side clearance. The grinder is a 40-year-old Sears 6 inch fitted with a GrindR™ table. The table is horizontal and we’re just grinding a 60 degree included angle (no rake). The tool bit is a 5/16-inch Crucible Steel CPM T15 HSS bit. Almost finished with it in this step. After finishing the back side clearance we need to grind the negative rake. Here, the table has been set to 18 degrees and the back rake is being ground. The bottom of the tool is up in this picture. It is almost finished when this picture was taken. Here’s the tool fresh off the grinder. Took me a little more than a half hour to get here – and I’m just a hobbyist. Not bad is it? The picture shows it in the cutting orientation. Once we finish grinding, we need to hone the cutting edge. A little bit of oil and a fine India stone do wonders for the cutting edge. 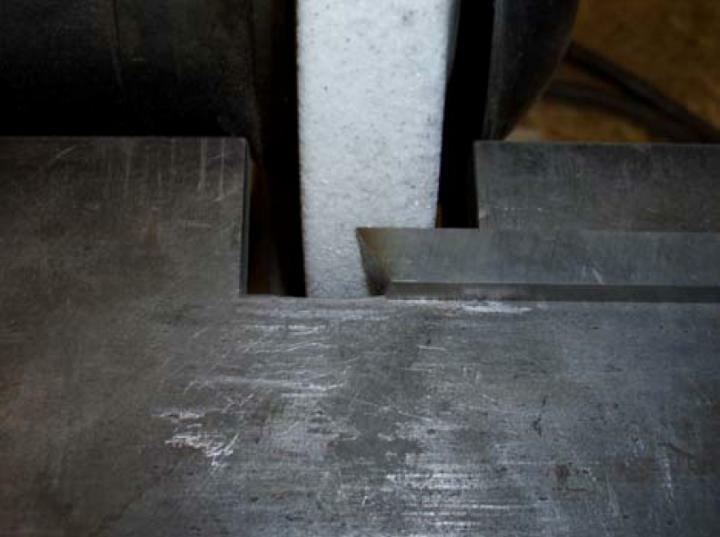 The cutting edge (the very front edge) must be razor sharp when you’re finished with this step. Here’s the finish ground and honed tool bit mounted in my QC tool holder ready for use. I thought I should show something other than steel which was shown above. Here's a piece of 0.5-inch aluminum from Home Depot mounted in my 3 jaw. It's not 6061 and it sure is "gummy" to machine. My knife tool is ready to cut. 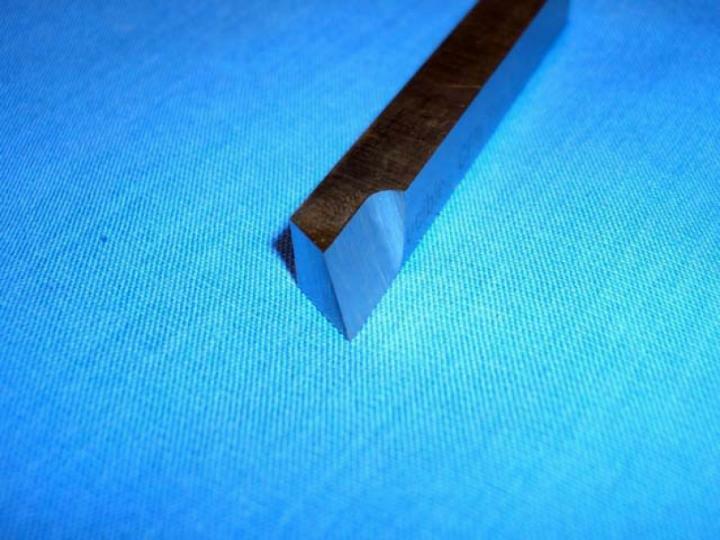 After a couple of passes with the knife tool this is the finish I got with the lathe set to auto feed. Looks worse than it really is. And here’s what it looks like after two passes with the ‘contrary finishing tool’ only .004 depth of cut – with the tool I just made. This was its first cut. I think I’ll keep it. This is the tool height setting I used. 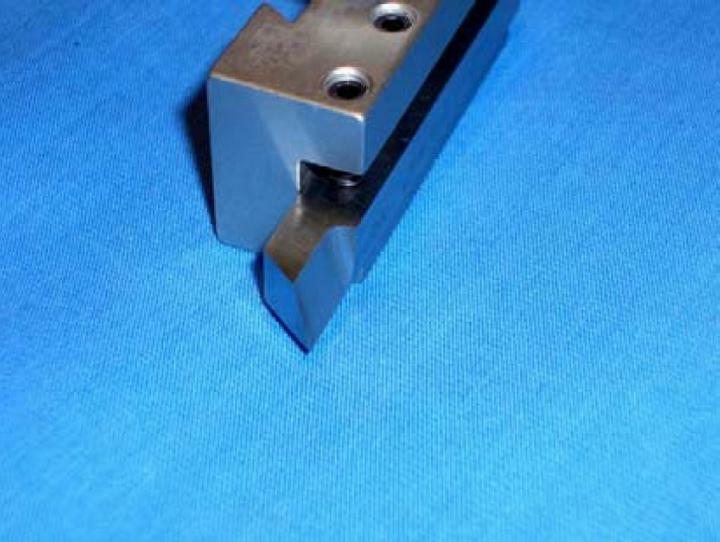 The tool cuts below the top of the tool and is tolerant of incorrect height adjustment. Notice that it does not cut from the top of the tool but rather from the front. Final comment. 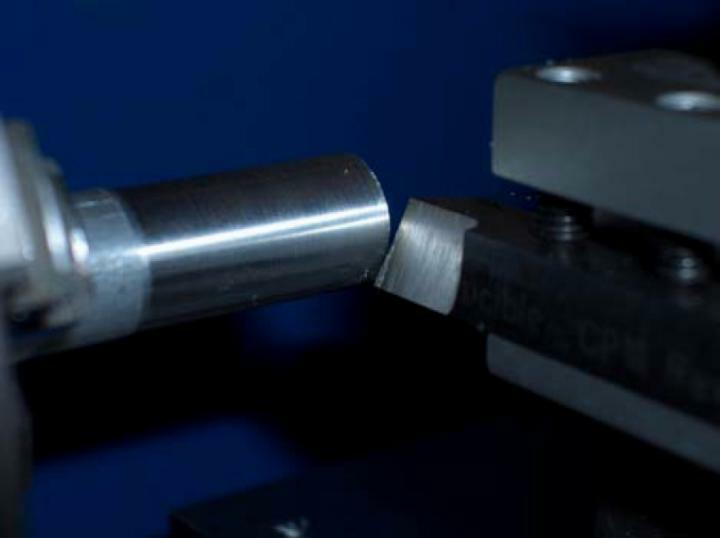 Is this tool the end all to your turned finish problems? NO! It’s a help but many things contribute to the finish. Mass, vibration, rigidity, sharpness, power and etc. do contribute. My Cummins 7×12 required me to carefully set gear clearance and align the lead screw to get any reasonable finish. This tool wouldn’t have helped me very much with my lathe ‘out of the box.’ But with a little thought and effort it’s worth it and I think this tool is a very worthwhile addition to your toolbox. Have fun and I hope this has been useful! I am having a lot of difficulties getting a nice finish on aluminum. I will try this tomorrow, but I’m curious what you mean when you say “set gear clearance and align the lead screw”. Could you provide an overview of the process for newbies like me? The drive gears on my Cummins lathe were too tight as delivered. I adjusted them by loosening them and inserting a small slip of paper between the gears then re-engaging them with the paper in between and tightened them. Rotate the gears by hand to remove the paper. This set the clearance for much smoother running. The pillow block on the right of my lathe was slightly out of line which caused a little binding and prevented smooth operation of the lead screw. I elongated the bolt holes on the pillow block very little, ran the carriage to the right, engaged the half nuts, then tightened the pillow block bolts. With these changes, the power feed became very smooth. This helped getting a better finish, then with the ‘finishing tool’ you can get the almost polished finish shown in the pictures. Hope this helps. I happened to read this recently and then had a perfect opportunity to put it to good use on one of my first home machining projects. Thanks! This is a titanium tension set engagement- a project that was simple but fun, and very important to me. I’m glad it was useful to you and now we know it works for titanium too. And, a beautiful ring!! My best to you and Colleen! I intend to machine a little steel piston with this technique! engineering I never came across a finishing tool like this. I ground a new piece of tool steel exactly as you described above and honed the final finish on 1000 diamond lap.Results were brilliant even when using slow hand feed. 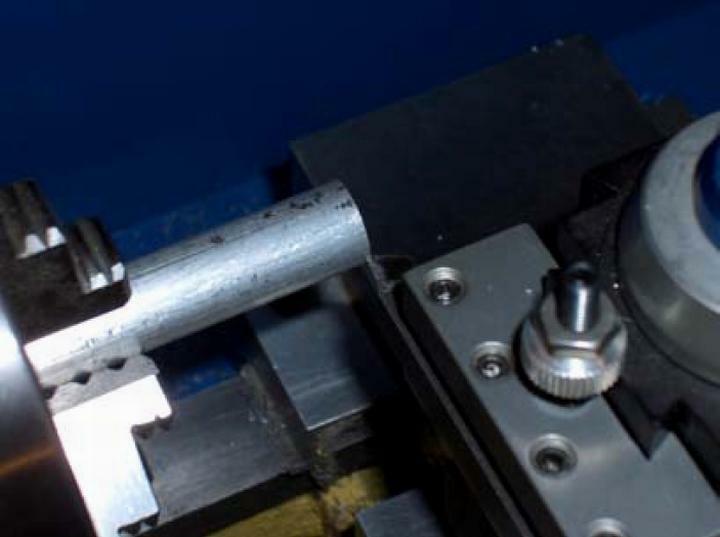 Just add one thing about finishes on small lathes.I have found over the years, to obtain a good finish,lock up either the cross slide or the saddle, depending in which direction you are cutting.This helps to cut down on any adverse vibrations due to wear. These tools are great for that final fine cut & finish. Gadgetbuilder has a write up on his site,(He calls it a ‘Vertical Shear Tool’. 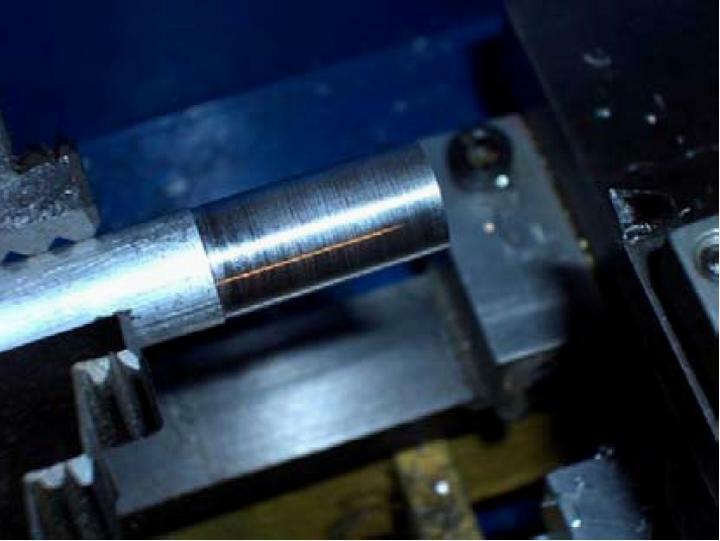 The actual design has been around for yonks and is commenly used on shapers for steel where it will give an almost polished surface finish. Very worthwhile to make and have at the ready. I have also made one with a brazed carbide tip for my shaper but as usual the HSS gives a much better finish. A pessimist is one who makes difficulties of his opportunities, and an optimist is one who makes opportunities of his difficulties.